Custom name stickers for the most demanding cyclists. High quality stickers for your bike and helmet. 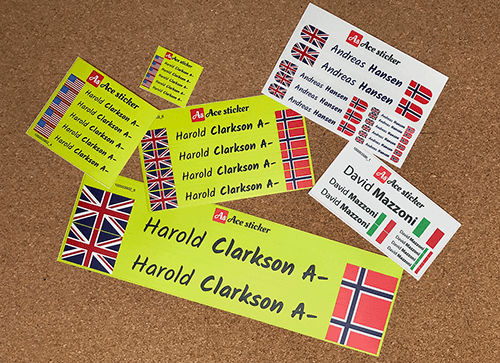 Customize your Stickers by Choosing your FLAG and typing your NAME. Do you want your LOGO instead of a Flag? Send it to help@acesticker.com Pack of 5 stickers. Choose the color of the background and letters. S: Pack of 5 stickers of 0,5 cm height. M: Pack of 5 stickers of 1 cm height. L: Pack of 4 stickers of 1,5 cm height. XL: Pack of 2 stickers of 3 cm height. Combo1: Pack of 4 stickers S, 2 stickers M and 1 sticker L.
Combo2: Pack of 6 stickers S, 3 stickers M and 2 stickers L.
Il top della gamma per gli adesivi da bici. Buenas tardes!! Muchas gracias por el trabajo bien hecho. Muy contento con mi pedido y por la rapidez con la que lo he recibido. Un saludo. Gracias por enviarme tan buen producto. Thanks for the awesome product! Absolutely love how it looks on my Salsa Fargo! Envoi rapide et Stickers de qualité !!! Thanks and great work on my stickers. Planning to get a new set for my other bike. Can't wait to see them on my bike! Excelente calidad, sigan trabajando así. Ottimi adesivi, la taglia S è perfetta per il casco da bici. Si incollano facilmente senza fare bolle e resistono anche dopo diversi lavaggi. Complimenti io ho acquistato da voi i miei adesivi e mi sono trovato benissimo, un tocco Pró alla specialissima..
Really good quality stickers! and great customer service. Good quality stickers! Perfect for my bike and helmet.